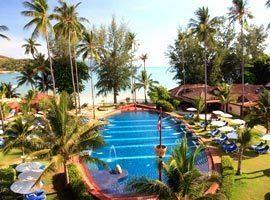 Booking 5 star resorts and hotels in Choeng Mon Koh Samui is a sure-fire way to guarantee a memorable holiday with luxury accommodation in the most upscale part of the island. Located on the north-east coast the area is beyond pristine, the views exceptional, the atmosphere is always relaxed and noisy disturbance highly unlikely. The intimate coves making up the bay is dotted by primarily deluxe type luxury hotels and some mid-range accommodation with good guest reviews. While being 10 minutes from entertainment in Chaweng, Choeng Mon Beach never sees large crowds ensuring peace and tranquility in an idyllic and intimate bay offering safe swimming year round. 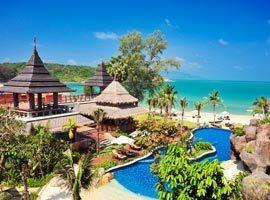 Many places here like Muang Samui's beachfront villas offer the perfect family accommodation, legendary beach resorts like Six Senses which enjoy a secluded location on a small peninsula offers romantic pool villas with great views while the highly recommended Tongsai Bay Resort flaunts a private beach. 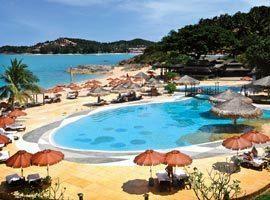 Akaryn is located on its own beach in tranquil Hanuman Bay in Bophut district, between Choengmon and Chaweng meaning your are also close to entertainment. Each of its villas come with its own pool. 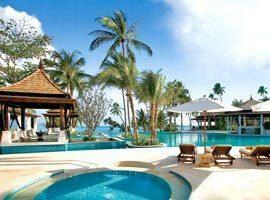 Imperial Boathouse is one of the most unique beachfront hotels in Samui. Here accommodation is offered in authentic rice barges which have been converted into luxury teak wood suites. 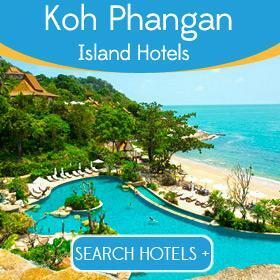 Nestling in a cove which is primarily for the use of is own guests you are guaranteed unhindered relaxation. 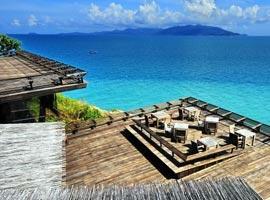 Melati offers romantic villa accommodation as well as 2 bedroom villas for families. With a waterfront setting which reveal spectacular views Baiyoke Seacoast offers luxury 1 and 2 bedroom pool villas with a Thai inspired design. Highlights include a spa with extensive treatment menu. Thai designed villas incorporating the warmness of wood in its features accented by oriental decor blend perfectly into an exotic landscape. Enjoy stunning ocean or garden views from private terraces. 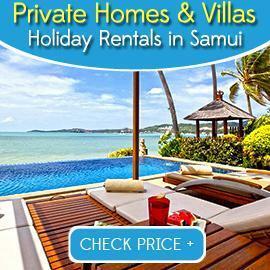 Sala Samui is a romantic couples hideaway, but is also a family pleaser featuring 1 and 2 bedroom private pool villas. Beachfront dining with your toes in the sand is complimented by a wine cellar. Honey cottages is a budget hotel with such great reviews we had to include it in our selected list of venues. 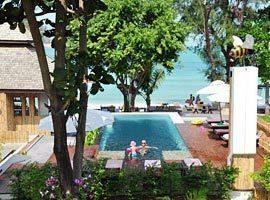 It offers charming cottages and restaurant right on the sand as well as a connecting family room. Whether yo are dining on the rocks, snuggling in bed, in your bath or in your villa's hidden pool you will enjoy the most dramatic ocean views interrupted only by Phangan island in the distance. 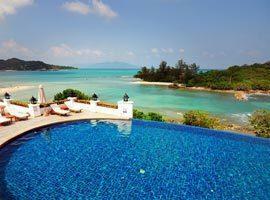 Enjoy views of the oasis-like pool adjacent to an idyllic private beach from your seaside cottage's outdoor terrace. 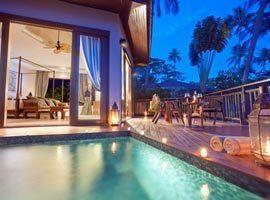 Alternatively you can soak in blissful seclusion in your own pool or jacuzzi.